My side profile rarely look good in pictures. If I had a choice, I’d prefer not to be photographed the 90 degree way. One of the main reasons of my reluctance would be my unshapely nose bump (yes really – which I will be sharing below). Plus, my round (+fat) face really don’t do much justice to my overall profile at all. Hence the main purpose of me deciding with this 10-minutes nose lift, was mainly to correct my nose bump, something which have been bothering me for awhile now. Again, Like what I’ve mentioned in my previous write-ups on Aesthetic Treatments – results are temporary, risks are minimal and enhancements are natural. 2 Types of threads were used – 1 for nose bridge; 1 for the nose tip. Numbing cream was applied on to the nose bridge for a good 30-minutes to rest. On top of the numbing cream, I was also injected with anesthesia injections. I didn’t feel any pain throughout the entire procedure. Since the objective was to correct a nose bump, there were 2 insertion points made, in between my eyes and the other on the tip of my nose. A total of about 10 threads were inserted via the insertion points. For those who’re looking on heightening the nose bridge, more threads would be inserted instead. Some people may take 2 sessions to complete the entire procedure, some may only take 1 session, depending on the objective. 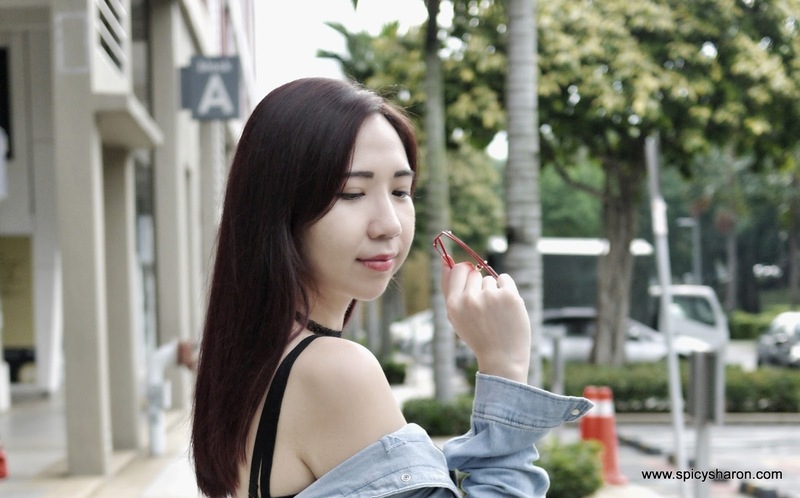 My first procedure was to correct the nose bump, whereas my second procedure was to give the nose tip a bit more volume, so that my nose would look straighter overall. The entire procedure typically lasted for about 15-minutes. I was allowed to go home immediately after that, and was given a 3-day dosage of antibiotics, painkillers (which I did not take) and a sample of antibiotic ointment, on both occasion. 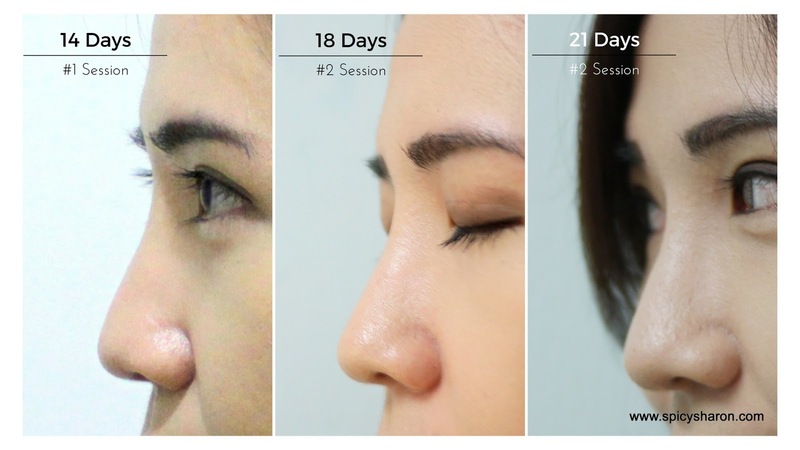 #1 Session – Enhancement of nose bridge. 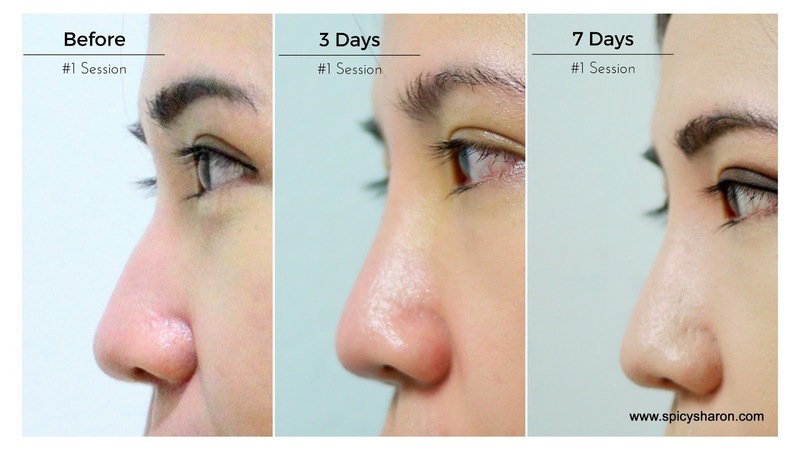 #2 Session – Enhancement of nose tip. On the first few days post-treatment, there were extremely mild swelling on the nose, but it went off after the 3rd day. In some cases, swelling may persist for about a week and there may be some bruising. For me, there was no bruising whatsoever. For the next 7-days or so, I felt a little bit of soreness, particularly along my nose bridge and certain areas below the eyes. It was not painful. I did, however, avoided wearing spectacles because I didn’t want to apply pressure on the nose. In addition to external care, I took loads of juices and fruits throughout the healing process, particularly berry-based, orange-based and even cilantro-based fresh fruit juices. I was fully recovered within 10 days, though best results can be seen after 2 to 3 weeks. For further information and pricing on the nose enhancement procedure, kindly refer to the contact methods mentioned below. Thank you ME Aesthetic Clinic for the confidence booster. Address: No,11,Jalan Sutera Tanjung 8/3, Taman Sutera Utama, 81300, Skudai, Johor.